The Offense: All in all, I’d have to say the starting offense looked pretty decent, all things considered: New Coordinator, new offense, new quarterback, condensed training camp, Visanthe Shiancoe out. I thought Donovan McNabb looked in control and comfortable, doing the veteran things you’d expect from him; pumping off a defender on a throw to Toby Gerhart and delivering a bullet to Percy Harvin for a third down conversion. With the exception of Chris DeGeare missing his block on Adrian Peterson‘s run and Charlie Johnson getting blown up on a failed third down run by Gerhart, the first team offensive line did a decent job and kept McNabb clean for the most part. McNabb also showed some elusiveness in the pocket; it was nice to see that mobility. Toby Gerhart looked pretty decisive with his cuts and Bernard Berrian has some opportunities to develop a rapport with his new quarterback. Berrian had a really nice catch of a pass that was thrown behind him on a slant route but on a forty-yard fly route he had a chance to go attack an underthrown ball but didn’t. That’s just not his game. But contrast that play with the one made by newcomer Devin Aromashodu on a long ball by Joe Webb: The defender had inside position on Aromashodu in a perfect place to make the play yet Aromashodu jumped up and over the defender to attack the ball and take it away from the defender and nearly coming down with it. Joe Webb had a mixed night. He came out with a hell of a pass to Jaymar Johnson on a slant route that he had to fit into a super tight window but then later threw an interception because he failed to look off the safety. The nice thing to see after that play was McNabb in his ear on the sidelines, presumably schooling him on finer art of eye control. Webb did show off his running ability, collecting 33 yards on the day and showing off his stiff arm skills on one run for a first down. The Vikings are obviously set at running back with Peterson and Gerhart and there ostensibly competition for the number three back but I’d be shocked if that guys name is not Lorenzo Booker when the season starts. Booker got extended playing time and made some great plays but also some mistakes. He started the day by waiving for a fair catch on a punt return attempt but then never attempted to catch the ball and, more importantly, never got the hell out of the way of the ball. He’s got an obligation in that situation to get clear of the ball so it doesn’t hit the ground, bounce into him, and become a live ball. Mental error. But as a rusher he showed that shake and bake ability he’s got and the burst he’s capable of with a long run of 19 yards. But he also coughed up a fumble. Still, Booker showed last year he can return kicks and he can be a versatile option on offense. Christian Ponder had a better night than Joe Webb in as much as he didn’t give up an interception. Ponder did a decent job of moving the team down the field, starting out with the easy play action roll out bootleg pass to rookie tight end Kyle Rudolph to get him comfortable. Ponder showed some happy feet, as you’d expect but the one thing that was as advertised with him is his accuracy on the run, which he displayed Saturday. He had bit of a rough time handling the quick drop-back passes but also showed some nice elusiveness. When the pocket started to collapse, he’d tuck the ball away like a running back, cradling it in his arm. While I guess that’s a good thing to be so conscious of ball security, I did find it a little odd. I don’t recall seeing a quarterback do that, they usually opt to hold it with both hands, instead, when there is a risk that it might get knocked away, which makes it much less difficult to pull the ball back up for a pass. Ponder showed some strength too on play where he was being wrapped up by a defender trying to take him down for a sack but Ponder didn’t get taken down, instead sending a pass to the back of the end zone that could’ve gone for a touchdown had he not overthrown his receiver. Return Game: Lorenzo Booker and Marcus Sherels both had a go at punt returning duties but it was Jaymar Johnson who literally took the ball and ran with it, taking a return back for forty yards with his speed. Johnson’s return ability coupled with the strong camp he’s having at receiver make him a front-runner to lock up one of the reserve receiver slots. The new kickoff rule has helped Ryan Longwell. The only frustrating aspect of Longwell’s game during his tenure as a Viking has been his inability to get the ball to the end zone on kickoffs. On Saturday, the opening kickoff went to the one yard line and his other kickoff went one yard deep in the end zone. The Defense: Let’s start by saying that we didn’t field our first team defense, with Jared Allen, Kevin Williams, Cedric Griffin and Antoine Winfield all being held out for precautionary reasons. But what we saw last night has got to be troubling. Cornerback Asher Allen missed a tackle on a screen play (during which a trailing Remi Ayodele made an impressive tackle) and followed that up by getting burned on a diving catch down the sideline. But that was nothing compared to Chris Cook‘s performance. I counted three missed tackles, then he got burned giving up the long touchdown to Yamon Figurs, and finally Cook got completely handled on the second quarter touchdown run where he was blocked out of the play. Keep in mind that Cook is coming off the two meniscus tears from last season but still, tough day, and we’ll need to depend on him. It’s probably a good thing that I really didn’t notice the safety play. Along the defensive line, I thought Everson Griffen showed some speed and explosiveness; Remi Ayodele disrupted and redirected one running play; and rookie Christian Ballard had one nice bull rush sack. Linebacker Erin Henderson got a ton of playing time and after a bit of a rough start where he got completely handled on a block by a tight end, settled down and had himself an active game. Fellow linebacker Jasper Brinkley whiffed, though, on what should have been a sack of Jake Locker on a blitz he managed to sidestep. I don’t know that many judgements can be drawn from this game but it was damn good to see the purple and gold on the field again. 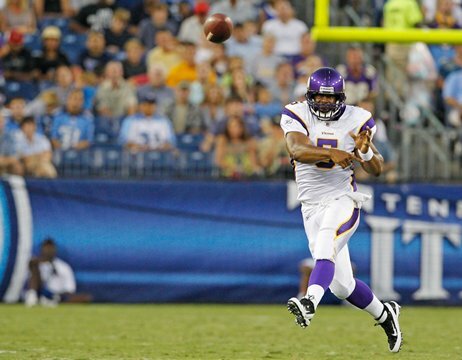 Former Vikings quarterback Daunte Culpepper is going to get a tryout in San Francisco to be a veteran backup to Alex Smith. Happy Birthday today to fullback Ryan D’Imperio (24)!